Cooking from Simply Nigella because: I’ve got friends coming over for a pre-Christmas get together on December 22nd and I need an impressive dish that I can cook in advance, freeze and then whip out on the day with minimum fuss. What I thought: In her intro to this recipe, Nigella tells us that she makes it when she wants ‘full on gorgeousness but nothing much to do when people actually turn up’, which is exactly what I look for in a Christmas dinner party dish. 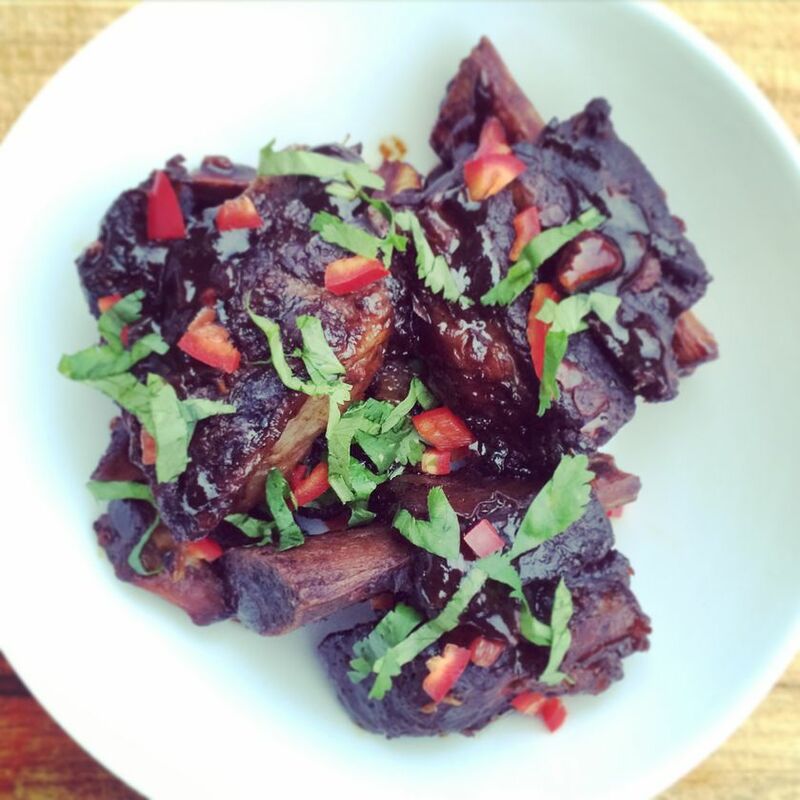 The short ribs had caught my eye when I watched Nigella make them on the Simply Nigella show (something about all that glistening chocolate-brown sauce seemed irresistible) so I was thrilled to find that the stew can be made in advance, frozen and then finished on the day you need it. The short rib itself was easy to find at my local butcher’s and was relatively inexpensive. A quick visit to the supermarket took care of the rest. The preparation took just a few minutes and then it was over to my oven to do all the hard work. I can honestly say it is worth making this dish just to fill your home with the smell of it cooking. The smoky warmth of the beef and the rich sweetness of the hoisin produced a gloriously plummy (and unexpectedly Christmassy) aroma that drove me absolutely crazy with food lust. If I could buy that scent and spray it around my house every day, I’d be a happy woman. And the taste? I’m not one for hyperbole, but this really is one of the most delicious dishes I’ve ever cooked. That such a small handful of ingredients can produce this intensity of flavour is quite astonishing. We enjoyed it as a family last night with plain rice and green beans (perfect Sunday comfort food), while the portions I need for my dinner party are now stashed in the freezer ready for a final hour in the oven on the day. I know my guests are going to fall head over heels in love with this dish, as I have, and I can’t wait to share it with them. Happy Christmas! 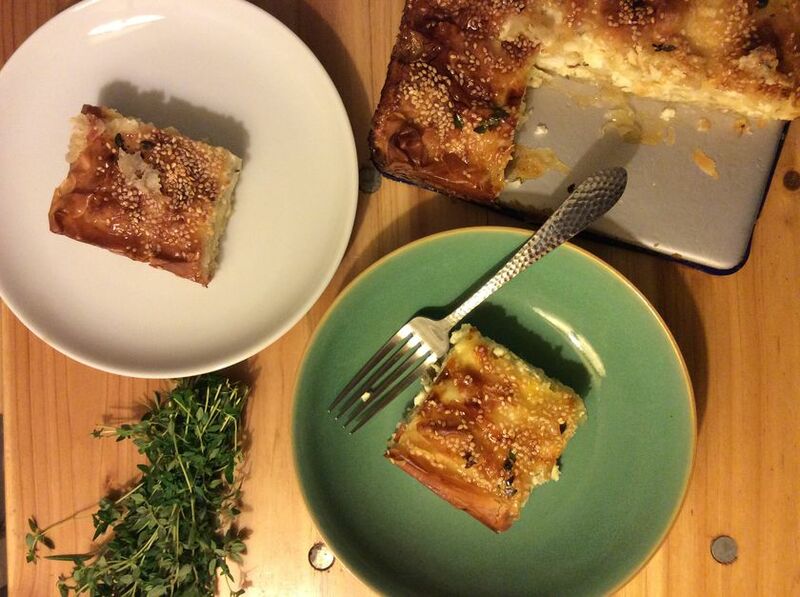 Cooking from Simply Nigella because: confession time: I don’t like Christmas food. Or rather I don’t understand the big deal with Christmas dinner. I do love cooking a roast with all the trimmings, but it doesn’t really tickle my tastebuds. Christmas for me is about communality, and far too much of a roast dinner stands on ceremony, with all the carving and dishing. A big family meal for me should be something that can be placed in a huge bowl in the middle of the table, and that everyone can dive into without any particular knife skills. Those are my quite frankly heretical thoughts on the whole matter. What I thought: That’s more like it. 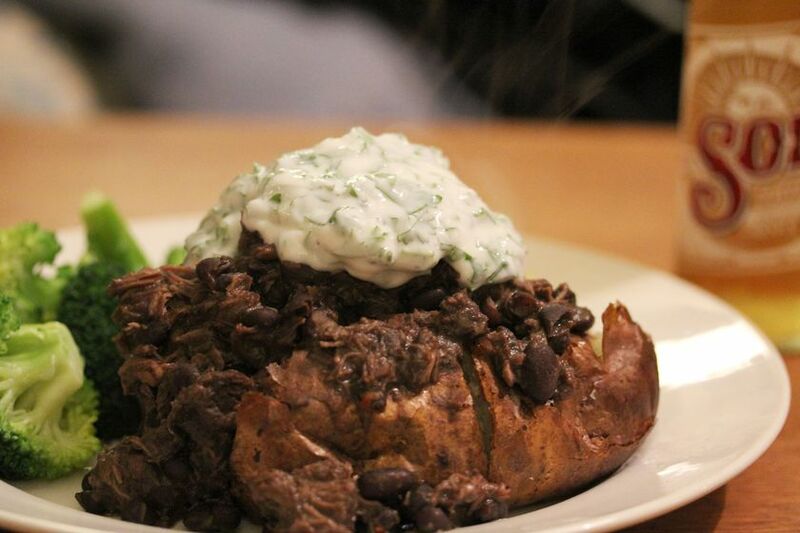 A dark, rich, spicy stew, something you can ladle out in generous quantities onto steaming baked potatoes and cover in cheese. And you certainly don’t feel cheated by the lack of a big centrepiece. This chilli is intensely beefy, with cubes of meat that just yield into tender shreds at the end of the four hours of slow cooking. The beans turn the whole pan pleasingly dark and the smell that fills the kitchen is drool-inducing. Christmas can also be a financially demanding time, so it’s worth noting that the beef here will feed 10 people for about the third of the cost of a turkey. Tasty and thrifty. An all round winner. Perhaps something for a new year’s feast if you just can’t bear the thought of forgoing the giant bird. Cooking from Simply Nigella because: With a number of dinner parties to attend and host over the Christmas period, I am looking for a dessert that is slightly different from the usual Yule log and festive cheesecake ,and doesn’t result in me slaving away in the kitchen for hours, crying into my Baileys because the thing has collapsed. What I thought: Unusual, but no the less tasty for it. Due to the feta and Parmesan, the dessert is almost savoury in taste and I have to admit to pouring quite a lot of honey over my square to get it to my desired sweetness. However, I have a massive sweet tooth while my boyfriend, who is definitely more of a savoury person, really enjoyed it. With the amount of sugary drinks, mince pies and chocolates we’re surrounded with during the Christmas period, it actually makes a nice break to have a dessert that is quite mellow in its sweetness. Another winning point for this dessert is that it’s not meant to look too perfect. Its name should have given me a clue! After all my worry that I hadn’t ripped the filo pastry sheets properly, or scrunched them up as Nigella would have wanted, I now realised that its charm lies in its rugged appearance and once it’s all lovely and golden brown, and cut into squares with a glistening of honey no-one will notice any small rips or lack of scrunches in the pastry. I will definitely be making this dessert again over the festive period. 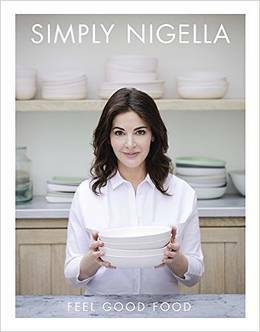 Cooking from Simply Nigella because: I’m cooking a big festive dinner party in a rather small flat and need a delicious pudding I can make ahead to avoid hostess-meltdown! 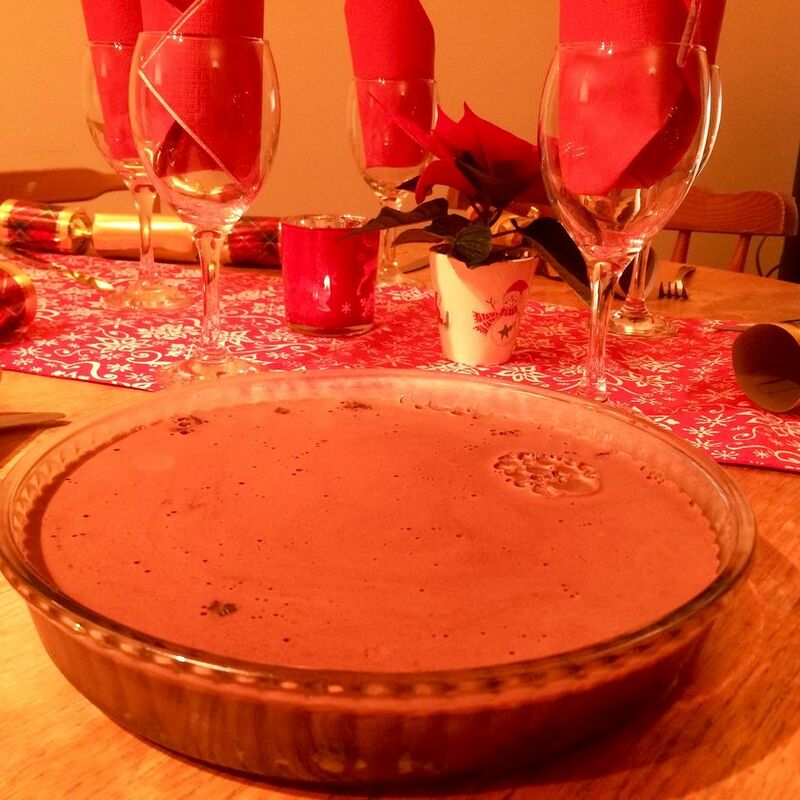 What I thought: This gorgeous chocolate tart was featured on an early episode of the Simply Nigella TV series. Its glossy simplicity really caught my eye – perfect for the middle of a busy festive dinner table. I was able to pick up all of the ingredients at my local supermarket ready to make the day before my dinner party. The tart is made simply in two parts – base and then an hour later, filling. Warning: if like me you don’t have a food processor, warn your neighbours/flat mates/loved ones that you will be spending about 10 minutes ferociously hitting a freezer bag of oreos with a rolling pin to prepare the more-ish biscuitty base. As for the reaction from my guests… the subtle combination of chocolate, smokey salt and a dark hint of espresso were an absolute hit. Served with just a dash of crème fraiche, this dark, delicious dessert vanished in happy silence. No ovens, no last minute rush and absolutely no stress – the perfect pudding recipe for party-throwers this Christmas! Enjoy! 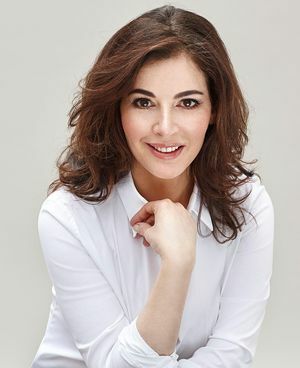 Nigella Lawson knows how to do summer food like no-one else. 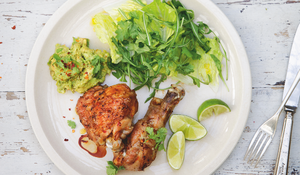 This wonderful, laid-back Med-inspired Sunday Lunch menu is perfect to share with friends on a sunny day.